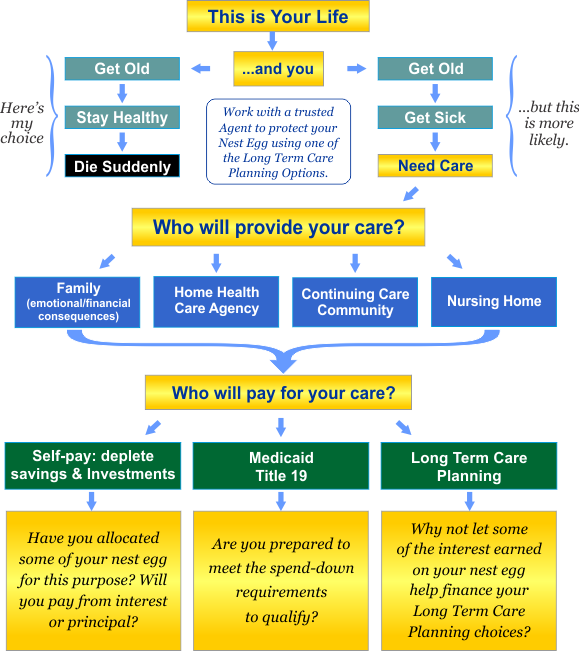 What does it take to get people to Plan for Long Term Care? What does it take to get people to consider planning for Long Term Care expenses? Unfortunately, for most people it takes a Long Term Care event hitting close to home, and they still assume Medicare and Medicaid will cover Long Term Care expenses until the truth becomes clear. Most health insurance policies (including Medicare) cover Medical Expenses but they DO NOT cover expenses for Long Term Care. Long Term Care is Custodial Care, the assistance provided to a person who has a cognitive impairment requiring continual supervision or is unable to perform certain activities of daily living (ADLs) such as bathing, dressing, or getting up from a bed or chair. Medicare only covers skilled nursing home expenses following a 3 (or more)-day hospital stay for up to 100 days and limited, intermittent, skilled home care. Your Health insurance policy has only limited coverage for these expenses. Your retirement assets can disappear quickly as Long Term Care can cost up to $12,000/month, depending on location. If you have retirement assets to protect from these expenses, you really should begin the Long Term Care planning process today. then respond to the preference questions. that protects your retirement plans! Your answers to the to the following questions will help guide you and your advisor in determining the best options to explore in accordance with your preferences. I want to take steps to protect against the risk of Long Term Care expenses depleting my retirement savings. If you checked "YES" there a number of planning options to be considered. I want a plan that specifically addresses the risk of Long Term Care expense and nothing more. If you checked "YES" a Traditional Long Term Care Insurance Policy would be the right choice for you. I'd like a plan that also includes a death benefit so if I don't need Long Term Care there will still be some benefit to planning for it. If you checked "YES" there are other options besides Traditional Long Term Care insurance which will provide a death benefit as well as protection for a Long Term Care need. I have money available which could be used as a lump sum premium payment to fund an appropriate plan of care. If you checked "YES" the door opens to additional asset-based Long Term Care planning options. but overlook the greatest financial risk, a nursing home stay or home care. Medicare may help (short term) & Medicaid is a last resort. This compelling video says it all. Watch now! 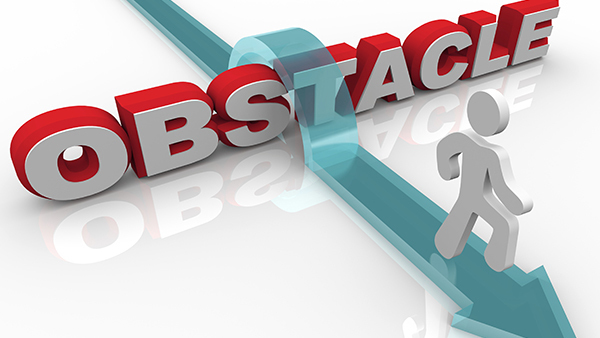 Here’s a look at the most common client objections about long-term care insurance, and how asset-based LI+LTC benefits and annuity+LTC benefits serve as the antidote to those objections. 1. Objection: I’ll lose it if I don’t use it. “Why should I pay for something I may not need?”is the objection financial professionals hear most often when discussing LTCi products with their clients, according to a 2015 OneAmerica survey of financial professionals. That concern becomes a non-issue with asset-based LTC products, which are guaranteed to provide either a long-term care benefit while the policyholder is alive or a death benefit that passes to beneficiaries tax-free if the policyholder never uses the LTC benefit. 2. Objection: I’m concerned the insurance company will raise my rates. Historically, this has been an issue with traditional long-term care insurance. The second-most-common client objection in the aforementioned advisor survey is rendered moot by asset-based LTC products, many of which can be purchased with a single premium. Other Care Solutions products have an annual premium that is guaranteed never to increase. 3. Objection: With my health, I will not be approved. With asset-based LTC policies, many cases are underwritten with a client phone interview and no medical exams. 4. Objection: The product is too complicated to understand. Asset-based products are no more difficult to grasp or to explain to clients than most traditional LTCi products. “Asset-based long-term care products are built on some of the simplest financial vehicles out there: whole life insurance and the fixed index deferred annuity,” said Chris Coudret, CLU, ChFC, Vice President & Chief Distribution Officer for Care Solutions. 5. Objection: The underwriting process is too long and/or invasive. Underwriting for asset-based LTC products is performed on a simplified, expedited basis, usually over the phone. Additional underwriting may be required for certain individuals. 6. Objection: I don’t want another insurance policy. I want an asset on my balance sheet that has the potential to grow over time. Because asset-based products are built on a life insurance or annuity chassis, their account or cash value may grow over time. Thus the value inside the contract is an asset that remains available to the client, and can be passed to beneficiaries if not used for LTC needs. In the case of life insurance, the proceeds can even pass income tax-free. “You’re getting an asset in an insurance product that serves the dual purposes of life insurance and protection from a long-term care event,” said Dennis Martin, FSA, FCIA, MAAA, Vice President, Senior Business & Product Development Officer, OneAmerica companies. 7. Objection: I want an LTCi policy that covers myself and my spouse or partner. Consumers and their financial professionals now have access to LTC+LI and LTC+annuity products that offer a unique joint benefit pool to two individuals under a single life insurance policy or annuity contract. 8. Objection: I’m worried about inflation eroding the protective power of my LTCi investment. Asset-based LI+LTC products can be purchased with an optional inflation-protection feature. Many observers expect prevailing low inflation rates to increase in the years ahead, which would bolster the value of such a feature. 9. Objection: I want the security of guaranteed LTC benefits for life. Certain asset-based LTC products offer optional extended LTC benefits to last a period of years or a lifetime. These lifetime benefits are available even after the base policy’s LTC benefit balance has been exhausted. 10. I’m concerned I’ll have to pay taxes on the money I withdraw from a policy to cover the cost of a long-term care event. Withdrawals from asset-based LTC products for qualifying long-term care expenses are income tax-free if the contract is funded with after-tax dollars. If you're interested in learning more about multiple new approaches to Long Term Care Funding, visit http://www.thompsonlifebrokerage.com/LTC-360/Index.html, our microsite exploring all the available options.